For this installment of Tech Tips I wanted to discuss some items that might help you improve your productivity. This can be accomplished by reducing the time it takes to do certain tasks, make your system more reliable and learning new tips and tricks. Problem: I waste time or I’m inefficient because I can’t see everything I need to on the screen when working. This is a common problem, because many times you might be working on a project that requires you to have multiple applications open. As an example, you might need your email open to be reading some information from a customer while simultaneously doing work for that customer in a separate application. Switching between those windows or trying to have them both up on the same screen while working on a task can be frustrating and inefficient. The solution is to have two monitors! Adding a second monitor generally is a very easy process and the return on investment is very high when measured in terms of productivity and getting things done faster and with less effort. If you have a laptop as your main computer you are in luck because adding a second monitor is as simple as going out and purchasing an inexpensive LCD monitor and attaching it to the VGA or other display connector that your laptop already has! When you plug in the monitor the first time, Windows will generally open a window asking what you want to do, you want to select “Extend the screen”. Now your desktop area has increased by the additional space provided by the second monitor. So you can keep your email open on one monitor and do the work a client is asking for on the second and both are visible at the same time! No more switching windows back and forth! If you have a desktop PC as your main computer, you’ll already have your monitor plugged into the monitor connector. 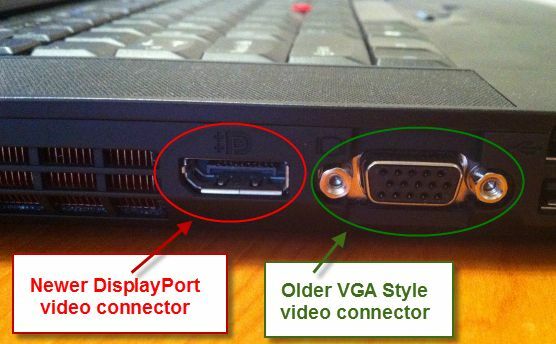 Some PC’s that were purchased with high-end video cards allow hooking up a second monitor just as you would do with a laptop (the video card might have two VGA display connectors). If not, you can add a second single display video card, or purchase a new video card that supports multiple display monitors. As the price of hardware has really dropped over the past few years, I’d recommend just getting a newer faster video card that supports multiple display monitors as these really aren’t expensive and you’ll have the advantage of a better video card as well. Problem: I wish I knew some keyboard shortcuts to reduce the time needed for common tasks. How often do you need to select some text and re-arrange it within a document? A lot of computer users select the text they want with their mouse and then go all the way up to the menu of the application to find “Edit” and then select “Copy”. They then go to the area they want to insert the text and after clicking to set the cursor send the mouse back up again to “Edit” and then select “Paste”. All that extra mouse movement and clicks isn’t necessary and wastes time, especially when you add up how often you perform these steps. Windows offers keyboard shortcuts to save you time when performing common tasks like this. To copy text, after you select it with your mouse, just hold down the Ctrl key and press the letter C. This does the same thing as going into the menu of the application and selecting Edit and then Copy. Similarly, to insert the text somewhere else, just position your cursor and then hold down the Ctrl key and press the letter V. This will paste the text into your document. Another common one is if you needed to select all the text in a document. Instead of going to the top of the document, holding down the mouse button and then dragging down to select page after page of text, simply hold down the Ctrl key and press the letter A. This will select all the text, pictures, etc. in the document and then you can use Ctrl C to copy the text. Ctrl V will then put that text into whatever other document you might need it in! One last one, on a PC keyboard you’ll see all those F1, F2, F3, etc. keys on the top of the keyboard. Many computer users don’t know what they are for or are afraid to touch them. Here’s a quick tip, the F1 is a shortcut for help. If you are in an application and need help, press F1. You’ll usually see a new window appear with help if you are trying to figure something out and don’t know how to do it. Problem: My hard drive died and now my system is down and I can’t get any work done! There are two solutions for this type of issue; however, you will need to implement them before disaster strikes! First and foremost, is to make sure you have a good backup strategy in place. If you are backing up your data regularly, you should be able to resume your work from another computer without delay. I recommend both a local backup and a cloud (aka Internet backup) for a few reasons. You need more than just one backup. I’ve seen many times a customer who reliably backed up their data only to find when it came to do an emergency restore that their backup wasn’t working or backing up what they thought it was! A local backup is a great thing to do and can be done with an inexpensive external hard disk or USB flash drive if your backup requirements are small. A local backup is important because you have it physically right there and the restoration of your data is very fast! A cloud based backup is also an important part of your backup strategy, because if you have a fire, flood, or some other natural or man-made disaster, your local backup might be destroyed along with your computer! So, it’s important to have an offsite backup as well. There are many vendors who provide this service such as Mozy, Carbonite, Crashplan, etc. so evaluate your options and pick the one that makes the most sense to you. The downside to cloud based backups is that backing up and restoring your data can take much longer than with a local backup system. Rob at Inline Tech is a 15+ year technology veteran in the IT industry. If you have any questions or need computer repair work in the New Hope, PA area, feel free to contact him via his web site at www.inlinetech.com.